Texas designer Erin Williamson turned the tired kitchen in her 1970s Tudor home into a bright, happy space for cooking and hanging out with her family. “The previous iteration was pretty dark and cramped,” Williamson says. 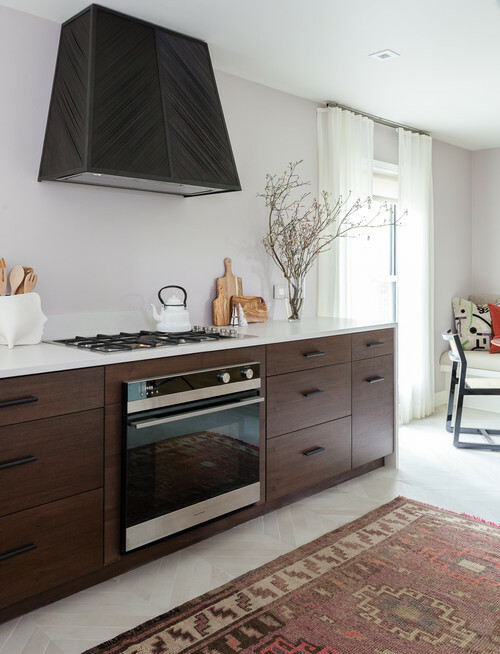 “The finishes were dated, and the layout was not serviceable for a family of four.” By removing a dividing wall, the remodel combined an existing kitchen and dining room into a flowing and functional space where the family could cook and dine together. 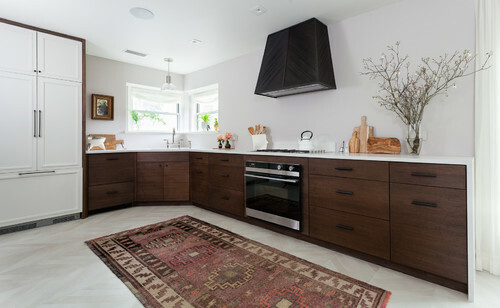 To create a flowing open-concept space, Williamson eschewed a kitchen island and instead grounded the space with a stylish antique Turkish rug. Because Williamson loves to cook, she put much thought into function. 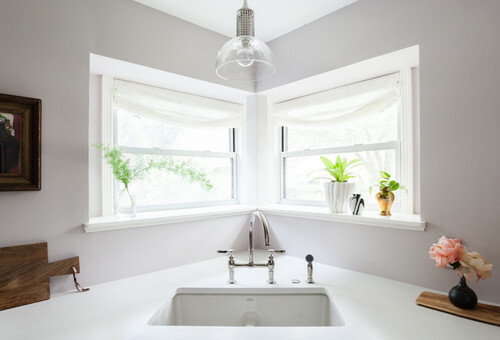 A low-divide Kohler sink in a custom color to match the countertops easily accommodates large pots and pans. Above the sink, a Hudson Valley pendant light is minimal and sleek. 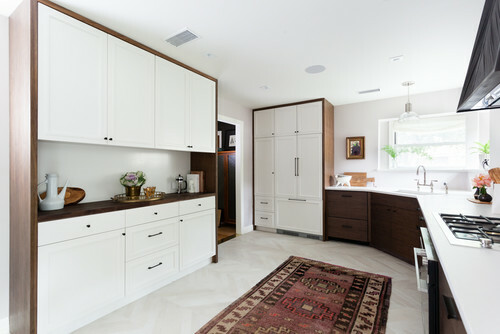 Since Williamson steered clear of cabinets and shelving above the walnut cabinetry, most of the kitchen storage was placed on the other side of the room. A white-painted hutch provides plenty of cabinets and drawers to tuck away dishes, pots and pans and even the microwave. 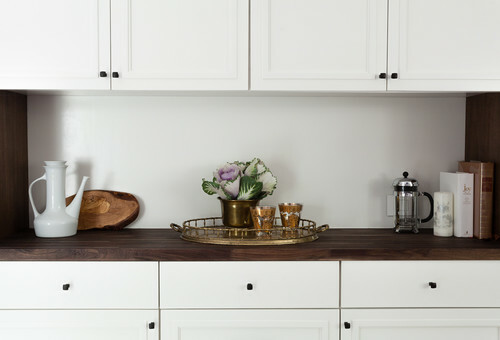 The hutch’s cabinets are topped with walnut butcher-block countertops. 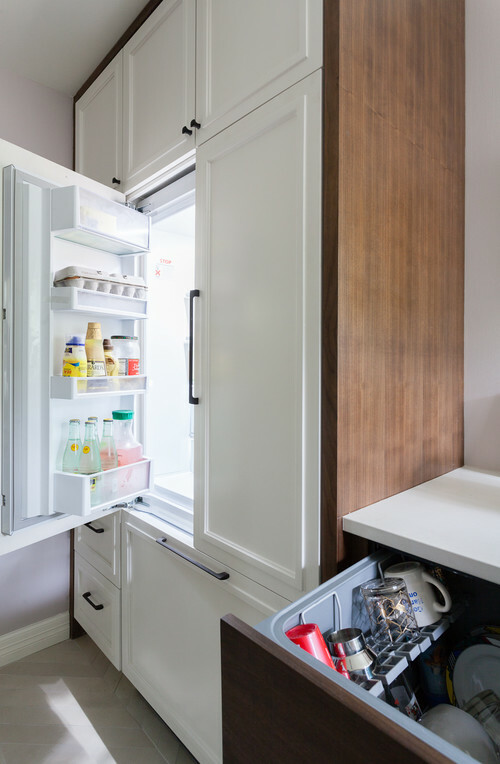 “There’s tons of counter space,” Williamson says, “double what we had in our old kitchen.” She used Legrand switches and outlets to keep the electrical elements pleasing to the eye. Local metal fabricator Brian Chilton created the oven hood by welding brass rods together. “It was the only thing on the wall, so it had to be interesting,” Williamson says. She purchased a Fisher & Paykel oven and cooktop, as she was looking for a range that was flush to the countertop. She used a small piece of Caesarstone countertop behind the cooktop as a backsplash. A 1970s Pierre Cardin chandelier illuminates the cheery eat-in kitchen. The back of the banquette is upholstered in an S. Harris tweed, and the cushion is covered in a faux leather so spills wipe up easily. A tulip table with a walnut top adds a modern edge while also tying into the walnut used throughout. And for additional seating, Williamson paired black cane-back chairs from CB2 with the contemporary table. Vintage sconces, abstract art, vibrant pillows and ethereal draperies add coziness to the dining area. Houzz is the leading platform for home remodeling and design, providing people with everything they need to improve their homes from start to finish. From decorating a room to building a custom home, Houzz connects millions of homeowners, home design enthusiasts and home improvement professionals across the country and around the world. You can also find Houzz on Facebook and Twitter.